Rather resembling a patchwork quilt of greens, the vineyards of Napa Valley are certainly in good supply, being found between Napa and the small town of Sonoma, north of San Francisco. The region serves as America's principal collection of vineyards and wineries, which now number over 300 in total - so plenty of choice for potential visitors! Within the Wine Country there are three main areas for exploration. Busy Highway US-29 is lined with some of the most popular wineries, which are best visited Monday to Friday, since weekends can be extremely hectic. Also of note is the Silverado Trail and Highway US-121, both of which tend to be a little less crowded at peak times. Head to downtown Napa and you will find some trendy eateries, former mansions now operating as stylish guesthouses, and wine-tasting opportunities galore. 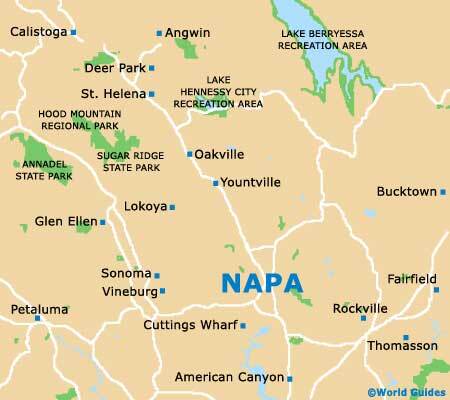 A series of useful Napa Valley links are shown below for prospective California visitors to make good use of. Napa Conference and Visitors Bureau - official website for the NVCVB. Sonoma Valley Visitors Bureau - visitor information and list of winery destinations. Napa Valley Welcome Center - 600 Main Street, Napa. Calistoga Visitors Center / Chamber of Commerce - 1133 Washington Street, Calistoga. Vintner's Collective / Multi-Winery Tasting Room - 1245 Main Street, Napa. Darioush Winery - 4240 Silverado Trail, Napa. Cade Winery - 360 Howell Mountain Road South, Angwin. Six Flags Discovery Kingdom - 1001 Fairgrounds Drive, Vallejo. Bale Grist Mill State Historic Park - 3801 St. Helena Highway, Calistoga. Hess Art Collection - 4411 Redwood Road, Napa. Bothe-Napa Valley State Park (California State Parks) - 3801 St. Helena Highway North, Calistoga. Petrified Forest - 4100 Petrified Forest Road, north of Calistoga. Chardonnay Golf Club - 2555 Jameson Canyon Road, American Canyon. Napa Valley Mustard Festival - annual Yountville event held in late January / early February. Old Faithful Geyser of California - 1299 Tubbs Lane, Calistoga. Grgich Hills Estate - 1829 St. Helena Highway, Rutherford. Domaine Chandon Winery - 1 California Drive, Yountville. Robert Mondavi Winery - 7801 St. Helena Highway, Oakville. Sterling Vineyards - 1111 Dunaweal Lane, Calistoga. PlumpJack Winery - 620 Oakville Cross Road, Oakville. Schramsberg Vineyards -1400 Schramsberg Road, Calistoga. Napa Valley Winery Bike Tours - 6500 Washington Street, Yountville. The French Laundry - 6640 Washington Street, Yountville. Silverado - 1600 Atlas Peak Road, Napa. Bouchon Bistro - 6534 Washington Street, Yountville. Hiro's Japanese Restaurant - 107 Petaluma Boulevard North, Petaluma. Tra Vigne Restaurant - 1050 Charter Oak Avenue, St. Helena. Zuzu Tapas and Paella - 829 Main Street, Napa. Annette's Napa Valley Chocolate Factory - 1321 First Street, Napa. Vallerga's Market - Redwood Plaza, near Highway 29, Napa. Napa Premium Outlets - 629 Factory Stores Drive, Napa. Sugarloaf Ridge State Park Camping Site - 2605 Adobe Canyon Road, Kenwood, near Santa Rosa. Chablis Inn Napa Valley - 3360 Solano Avenue, Napa. Napa Valley Hotel and Suites - 853 Coombs Street, Napa. Vino Bello Resort - 865 Bordeaux Way, Napa. Auberge du Soleil - 180 Rutherford Hill Road, Rutherford. Meadowood - 900 Meadowood Lane, St. Helena. Cottage Grove Inn - 1711 Lincoln Avenue, Calistoga. Calistoga Inn - 1250 Lincoln Avenue, Calistoga. Golden Haven - 1713 Lake Street, Calistoga. Sonoma Hotel - 110 West Spain Street, Sonoma. El Pueblo Inn - 896 West Napa Street, Sonoma. Oakland International Airport - 1 Airport Drive, Oakland. Sacramento International Airport - 6900 Airport Boulevard, Sacramento. San Francisco International Airport - Terminal Access Road / South Airport Boulevard, San Francisco. Napa Valley Wine Train - lunch and dinner trips each day. Napa County Transportation and Planning Agency (NCTPA) - with information about routes, schedules, fares and passes - 707 Randolph Street, Napa. Greyhound - long-distance coaches, with services, routes, fares and travel information. Golden Gate Transit Company - San Francisco buses, connecting Petaluma, Santa Rosa and Sonama - 1011 Andersen Drive, San Rafael. Sonoma County Transit - bus transport around Sonoma Valley - 355 West Robles Avenue, Santa Rosa. Napa Valley College - located at 2277 Napa-Vallejo Highway, Napa. Culinary Institute of America - 2555 Main Street, St. Helena.